For use with Hell On Earth Reloaded. Art By Alida Saxon. 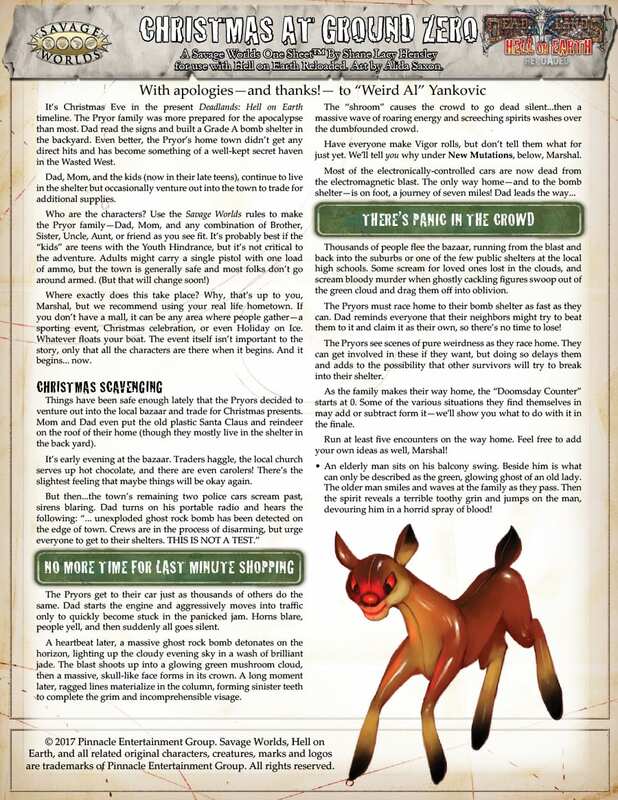 It’s Christmas Eve in the present Deadlands: Hell on Earth timeline. The Pryors decide to venture out into the local bazaar for Christmas fun. It’s early evening at the bazaar. Traders haggle, the local church serves up hot chocolate, and there are even carolers! But then…police cars scream past, sirens blaring. And the radio blares out: “… unexploded ghost rock bomb has been detected on the edge of town …” Horns blare, people yell, and then suddenly all goes silent. The Pryors must race home to their bomb shelter as fast as they can and also beat their neighbors to it so they can’t claim it as their own. There’s no time to lose! The “Doomsday Counter” starts at 0!